Each cell in this model is one of three states: burnable-green (0), burning-red (1) or burned-black (2). If a burnable cell has a burning neighbor, it will become burning in the next generation with a certain probability. Each burning cell burns for exactly 1 generation, and then changes to burned. Each cell can also be part of a firewall (state 3). 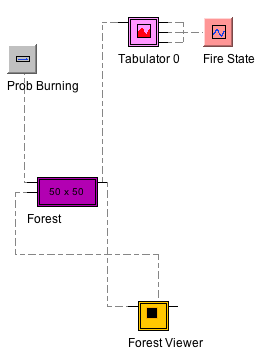 Firewalls (blue) remain in a fixed state and can prevent fires from spreading. The treecell submodel operates similarly to the cell used in the Conway’s Game of Life, computing the next state at each generation (in the “Next_Burning” codechip). 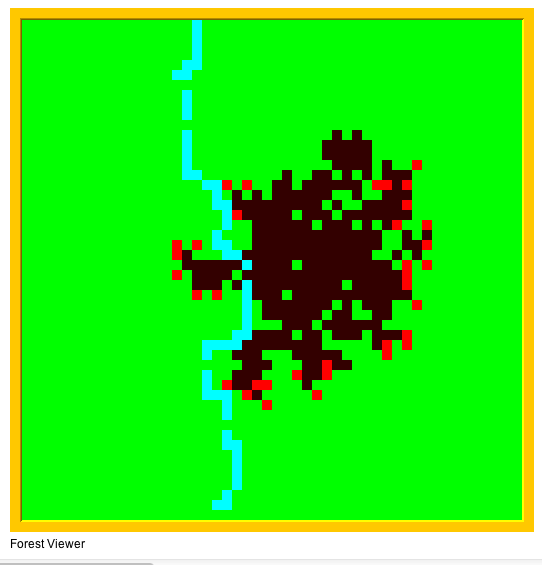 The cell neighborhood is computed at the beginning of the simulation and stored as a property; it is referenced in the “Next_Burning” code to determine if a neighbor is burning. The tabulator plug-in provides state data which is graphed.